Close-up of a banner of the DJI Mavic Air, which DJI is supposedly planning to announce officially in less than 24 hours. We’re less than 24 hours away from the drone announcement DJI started teasing last week, and it looks like our guesses based on the tagline “adventure unfolds” were spot on: it’s going to be a folding drone. More specifically, a followup to the folding DJI Mavic Pro… but not the followup most of us expected. 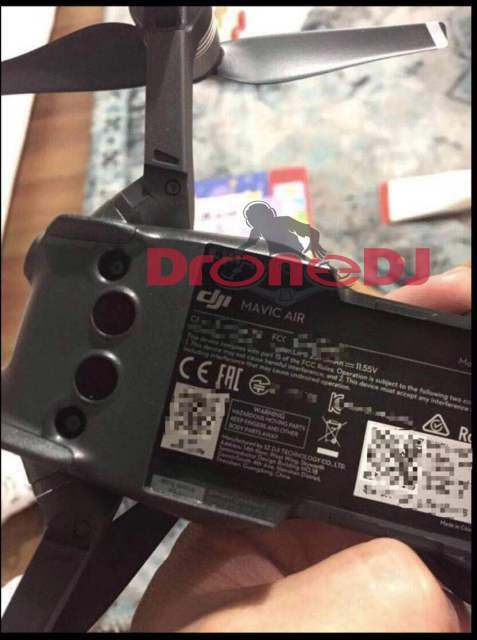 According to Drone DJ, who got ahold of a treasure trove of leaked specs and photographs of the upcoming drone, DJI is preparing to announce the DJI Mavic Air: a drone that looks like a hybrid between the DJI Spark and DJI Mavic Pro. If these leaked photos and specifications are accurate, the Mavic Air will put Mavic-level hardware—a 3-axis gimbal, 32MP 1/2.3-inch CMOS sensor, 4K 60p video capture, obstacle-avoidance sensors on the front, back, and bottom—into a body that looks very much like the diminutive DJI Spark. The upside is that 4K 60p video capture that the Mavic Pro and even Mavic Pro Platium has been missing; the downside is that the smaller body means even less flight time, which is rumored at just 21 minutes. We won’t be able to confirm these specs until the official announcement tomorrow morning (DJI is streaming the event live at 10am Eastern), but leaks this major and this close to the official reveal are rarely faked. Which leaves us feeling a bit… “meh” about the whole thing. With Autel Robotics releasing its Mavic Pro competitor Autel EVO at CES, and the original Mavic Pro now nearly a year and a half old, we were hoping for a true Mavic Pro replacement. The Mavic Air seems, instead, like a DJI Spark upgrade… or even what the DJI Spark should have been at launch. That said, we agree with Drone DJ when they say that this is probably not the true successor to the DJI Mavic Pro, but a separate product line—sort of like Apple’s MacBook Air vs MacBook Pro. It just means we have a bit longer to wait before we see a true Mavic Pro replacement.